Though a grand tour title or clutch of classics victories may guarantee a rider’s name in the history books, it is only the World Championships which provide the winner with a set of rainbow bands to be worn throughout the entirety of the following season. It is a rare occasion for a rider’s peak to overlap perfectly with a World Championship course tailored neatly to their strengths, especially given the forever changing choice of venue for the contest. This year’s host is the somewhat controversial Qatari capital of Doha, a nation far from known for its love of professional cycling, while also providing the type of weather which would normally render people disinterested from even sitting in the sun; let alone riding a bike. 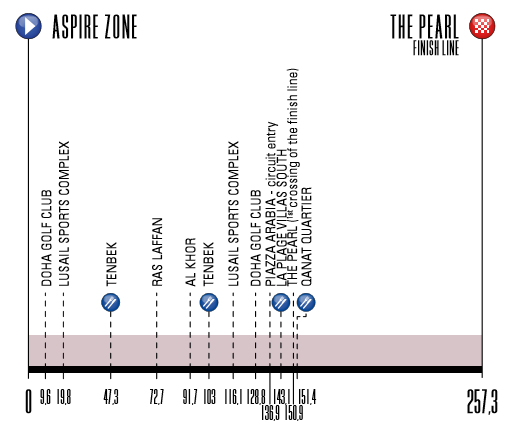 Rolling out from the inspirational sounding Aspire Zone, it will take the peloton 257.3km to cross the finish line at The Pearl via an almost featureless route. With this in mind, it appears to be the day’s weather which is most likely to fuel any drama during the race, with teams such as Belgium and The Netherlands eager to take advantage of potentially strong desert winds by splitting the race to pieces through forming echelons. The regions scorching sun has already proven to be an issue during the preceding World Championship events, pushing riders to the brink of heat exhaustion on occasion. Perhaps more than any other edition of the World Championships in recent years, the importance to conserve energy and avoid going into the red will be paramount to those with a chance of winning; riders with a maximum roster of fully committed teammates at their disposal could thus possess a sizeable advantage. A 15.2km circuit will form the final 120.4km of this year’s race, comprising numerous sweeping bends and roundabouts, but essentially an easy enough course to navigate safely. The trickiest part once the pace reaches its maximum will be a series of tight hairpin turns which can immediately open up gaps amongst the peloton, forcing those at the back to sprint hard in an attempt to stay with the frontrunners. These tight bends feature in the final kilometres, the last of which exits onto the flamme rouge and into the one kilometre long stretch to the finish line. It looks certain to be a reasonably sized bunch kick which crowns 2016’s champion, but given the innate unpredictability of a single day in the saddle, there are no promises to be made in Doha. Mark Cavendish had recently been laid low by illness and has not enjoyed an ideal preparation, instead finding himself recovering in bed for several days rather than tapering his form ahead of the big day. Having previously won the World Championships in 2011, the British rider knows what it takes to sustain a serious bid in pursuit of the rainbow bands and has confidently stated that his team for 2016 is superior to that of his previously victorious world’s squad. There is no doubt that he can handle the distance when in ideal form, has proven success in these Middle Eastern races, has assembled an extremely fast looking leadout train and knows how to navigate the maelstrom of the sprint. Surprisingly overlooked by many for this chance of becoming a double World Champion, his awkward preparation may have been a blessing in disguise, masking his form and arriving in Doha slightly out of the spotlight. André Greipel is able to churn out enormous power to dominate these drag race style sprints to the line and has been focusing upon his build-up to this event with immense precision. There are suggestions that he may not be able to handle the distance, but given his performance at this year’s Ronde van Vlaanderen and victory on the 233km Stage 5 of the Giro d’Italia, he has shown that this is not necessarily the case anymore. His biggest hindrance is likely to be the team at his disposal, a German squad of only five other riders; two of which are the questionably supportive Marcel Kittel and John Degenkolb, while Tony Martin is no doubt still recovering from his world title winning time trial performance. This truly only leaves Nils Politt and Jasha Sütterlin to protect Greipel throughout the day as he looks to conserve his energy as best as possible. It might be a struggle to get a good position ahead of the finish without the quality leadout he is normally used to, but the wide and straight final kilometre does look perfect for Greipel to bury his rivals en route to becoming the first German World Champion since Rudi Altig in 1966. Alexander Kristoff secured the points classification at the Tour of Qatar in 2016 and 2015, winning the same three stages in both editions, thus demonstrating his ability to perform in these testing conditions. The Norwegian rider has not enjoyed a vintage year, but he is well versed in rising to the top at such long races despite lacking sparkling form in 2016. A simple sprint over 600m would not place Kristoff in the same league as many of the contenders, yet the same exercise after more than 250km of racing can compensate for this greatly and will be a definite threat to the obvious favourites as a result. He boasts a strong team at his disposal and may even have the chance to call upon compatriot Edvald Boasson Hagen to lead him out; another rider who has found success in these desert races. Peter Sagan will have won an even greater number of fans during his stewardship of the rainbow jersey, delivering a year long series of victories and incredible performances to secure the prestigious jersey one of its finest ever seasons on the shoulders of a World Champion. The potentially gruelling nature of this year’s race could once again bring Sagan into contention as this 257.3km race reaches its final stages, even more so off the back of some of his finest bunch sprints in recent years during 2016. He is a master of weaving between the wheels, staying out of trouble and only making his presence felt when victory is within touching distance; an anonymous Sagan for much of the day could indicate a similar performance as to Richmond last year which first earned him the rainbow bands. Fernando Gaviria demonstrated his immense turn of speed at the biggest races in 2016, while also proving that 200km+ routes are already within his capabilities. There is not a brilliant Colombian team for him to call upon, primarily due to those assembled around Gaviria being poorly suited to the extremely flat Doha course. However, if things play out fortuitously for Gaviria, there is no doubt that he can out sprint the bigger names here. Dylan Groenewegen is another young rider who has already proven to have the speed necessary to better some of cycling’s biggest names in the sprints. The Dutch rider has been provided with a convincingly strong leadout train, one which may prove to have the engine power to drag Groenewegen into an ideal position to sprint from; Tom Dumoulin and Niki Terpstra likely to make life tougher for their rivals. The greatest issue is whether or not the young Dutchman can indeed survive the course in a good enough condition to even contest the likely sprint finish. Elia Viviani and Giacomo Nizzolo offer a definite headache for the Italian selectors as to who should truly be the protected rider in a bunch kick. In a simple question of speed, Viviani is the proven rider capable of beating top sprinters such as André Greipel and Mark Cavendish; whereas Giacomo Nizzolo is better equipped to handle a 257.3km race which may become incredibly gruelling. The Italian squad is a convincing leadout train, and if the selectors are only interested in the win, then they would be best to invest everything in to working for the faster Viviani, but a tougher race will immediately swing favour to Nizzolo. Nacer Bouhanni and Arnaud Démare are posing a similar selection headache for France, though their talents contrast far more clearly than that of the Italian sprinters. Bouhanni is one of the few contenders to have part of his trade team’s leadout train present alongside him here, but the work of Geoffrey Soupe and Christophe Laporte has not been consistent in 2016 and may not prove to be as big an advantage as others perceive. His incredible acceleration and tenacity (some would describe it less positively) make him a dangerman amongst a hectic sprint, while his documented ability to survive harder races than this of similar distances means he should be there to battle it out at the end. Arnaud Démare is in great form in the latter stages of the season once again and is a rider who has already tasted success with the rainbow bands at U23 level. He certainly lacks the speed required to beat the majority of favourites, but a race made harder by the likes of The Netherlands or Belgium for example would diminish the field and bring Démare to the fore without a doubt. Victory at Milan-San Remo demonstrates his ability to cope with the demands of 250km of racing, but plenty will state that Bouhanni’s mechanical in the final moments is what truly delivered victory to Démare. World Championships are not afraid of producing unexpected winners, so riders worth keeping an eye upon include: Marcel Kittel, Michael Matthews, Caleb Ewan, Ramunas Navardauskas, John Degenkolb, Tom Boonen, Edvald Boasson Hagen and Matti Breschel. Though there are teams eager to make life difficult and hope to fracture the race early on, it seems certain that the large amount of nations seeking a relatively simple sprint finish will ensure we are offered the most hotly contested bunch gallop of 2016. There are a few technical aspects late on, with the most focus being placed upon the final turn into the deciding kilometre up to the finish line, a corner in which the race may be lost for several riders. The final kilometre is an almost perfectly straight run into the finish on a wide tarmac road, ideal territory for those able to put out big watts to seize the day and the rainbow jersey. With this in mind, André Greipel and Mark Cavendish soon emerge as the clear contenders to lead the charge to the line, leaning slightly more so towards the German due to Cavendish’s recent illness; the British team is far superior however. Alexander Kristoff, Peter Sagan, Nacer Bouhanni and Fernando Gaviria all have the speed to be in the mix, no doubt ensuring the final kilometre is more thrilling than the entire preceding 256.3km of racing. Posted on October 16, 2016 by Spokenforks	This entry was posted in News, World Championships 2016 and tagged Alexander Kristoff, André Griepel, Arnaud Démare, Caleb Ewan, Doha, Dylan Groenewegen, Edvald Boasson Hagen, Elia Viviani, Fernando Gaviria, Giacomo Nizzolo, John Degenkolb, Marcel Kittel, Mark Cavendish, Matti Breschel, Michael Matthews, Nacer Bouhanni, Peter Sagan, Qatar, Ramunas Navardauskas, Tom Boonen, World Championship Road Race, World Championship Road Race 2016 Preview. Bookmark the permalink.